This post is fun for a couple of different reasons-food and public reactions. Following the main day Saturday of workshops at the Trans Ohio Symposium, it was time for Liz and I to head on back to our hotel room, take a break and head out for a night on the town in Columbus. 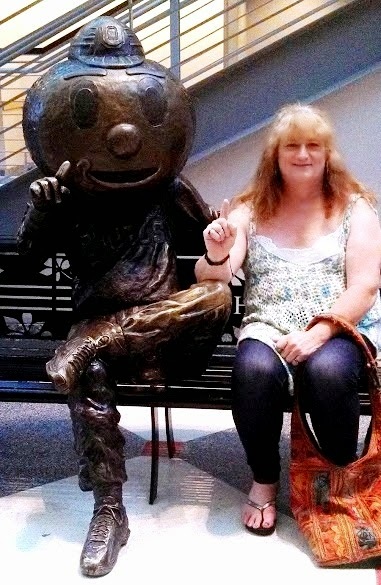 The picture on the left is taken at The Ohio State Student Union with the Buckeye Mascot, Brutus Buckeye. Of interest to me is how I could tell the effect of HRT is affecting my legs-adding a rounded feminine outer layer of fatty tissue under the skin- extending up through my hips and rear. To make sure I didn't slide backwards, I made plans to take Liz to one of the best "burger joints" in the country that night- Thurman's in Columbus, Ohio. Thurman's has been in business since 1942 and does have tremendous hamburgers! The only problem I ran into was I had to eat them far more femininely (with a fork) than I ever did before. Fortunately, I live very close to Columbus and have plans to attend TGLBQ Pride with Liz in a couple of months! So a trip back is coming up soon.